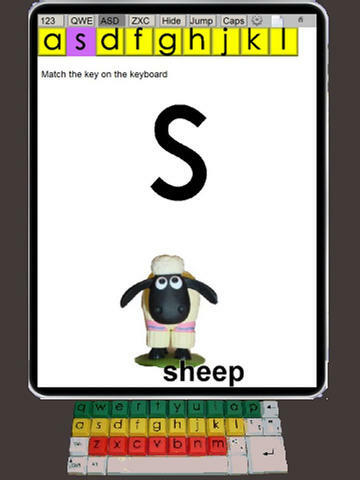 This is very practical and simple app that introduces children to letters, to associate the letters with words and to locate the letters in a keyboard. The app has been created by an Occupational Therapist in order to help children with physical or learning disabilities. This is a good app to incorporate into a child’s portfolio of apps as it specifically considers teaching how to type and the location of letters on a keyboard as well as teaching the alphabet. We have given this app 5 Stars because of this unique feature. This is an interesting app because it does more than just teach the alphabet and pronunciation of the letters. It also aims to develop motor-skills and improve the association with letter and letters on a keyboard. Despite the fact that children are more and more into technology, it is paradoxical that typing is still something that needs practice and a bit of learning. To this end, the data collection that details the number of correct answers that your child got, also takes into account the amount of time that it took to associate the letter with the letter on the keyboard. It is good to see an Occupational Therapist identify the issue and also take ownership on its solution We hope that Susan Hossack can lead this example and encourage further thinking and development for educational mobile learning. The learning process is simple. Firstly, you are required to state the type of keyboard that you have so that the app knows how set up the game. The letters are not displayed in alphabetical order; rather they are display in the order of the keyboard. 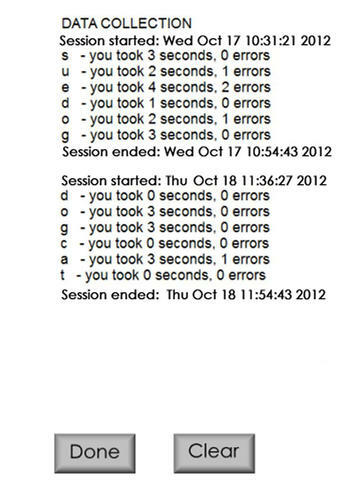 In other words the three lines in the QWERTY keyboard. Therefore, the first line is from “Q to P”, the second line is from “A to L” and the third line is from “Z to M”. In settings you can also set the game as “ABC” so that the letters are shown in alphabetical order and you have to find them on the keyboard. A nice little challenge for young ones who are unfamiliar with the keyboards! The numbers 0-9 are also included. The idea is that each letter is called out and you have to identify it in the keyboard. You can set whether you want to show the letters in capital or lower case and also, whether you want it in order of the placement in the keyboard or, whether you would like it to be randomised. You can really tell that Susan Hossack has taken time and care to offer an app that is truly engaging and relevant to kids. We really enjoyed this app, and we hope that your children will do too. 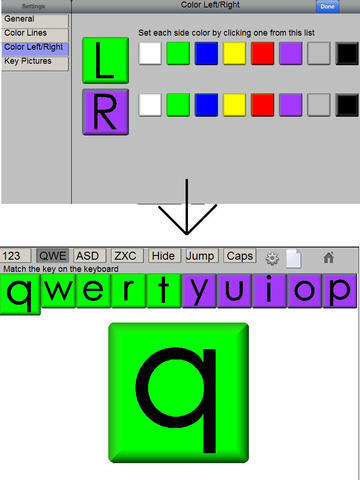 This app is designed by an Occupational Therapist to help children with physical or learning disabilities identify where keys are on the keyboard, then learn to type and spell. 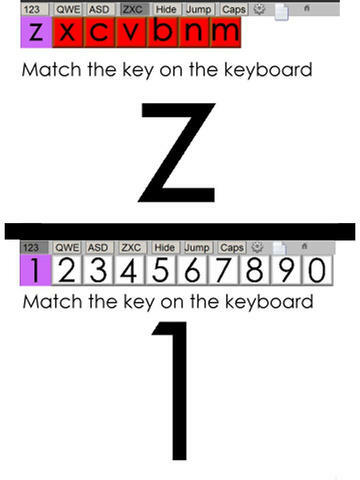 This program is compatible with both the IPAD on-screen keyboard, and with standard or BigKeys© keyboards. 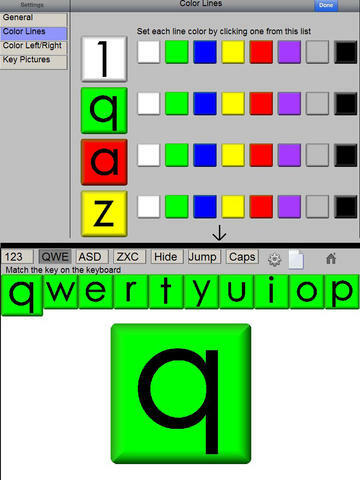 Each keyboard line may be selected, and the child asked to match the letter. Letters can be presented in order, or at random. Display all the letters on the line, or just the letter to be matched as desired.